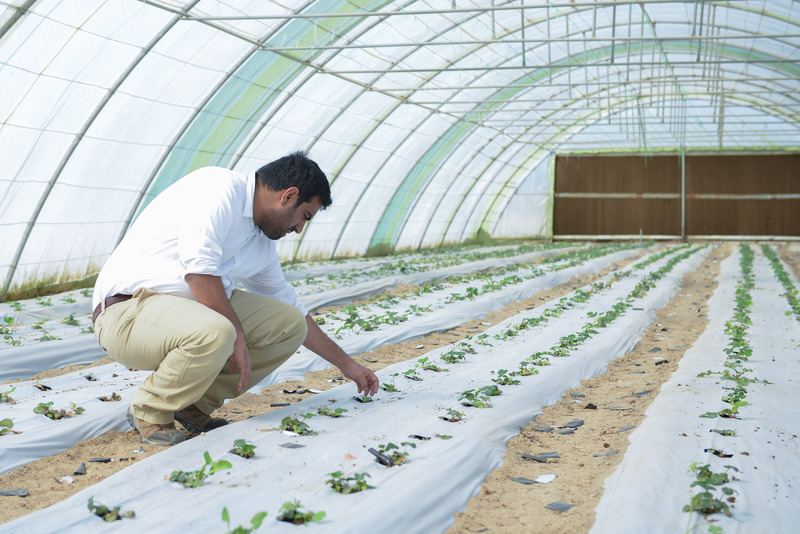 Run by a young, second-generation farmer, Kenaneya Farm is located in Abdali, in northern Kuwait. 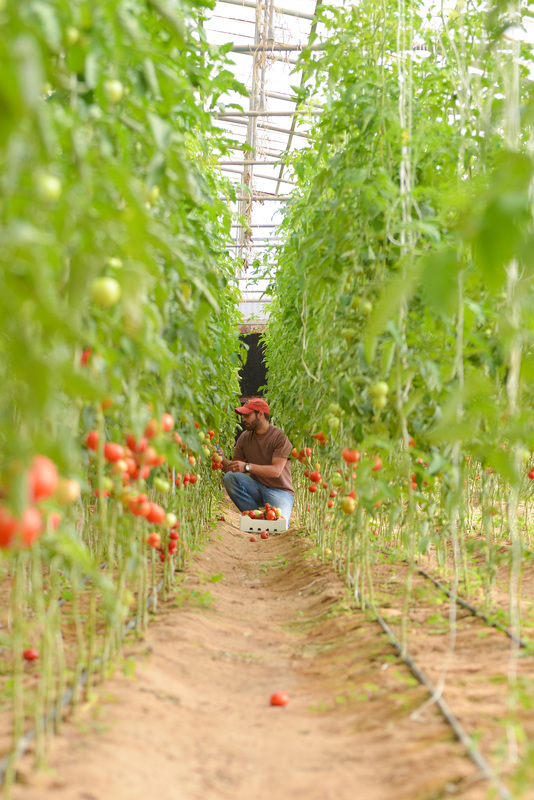 Run by a young, second-generation farmer, Kenaneya Farm is located in Abdali, in northern Kuwait. 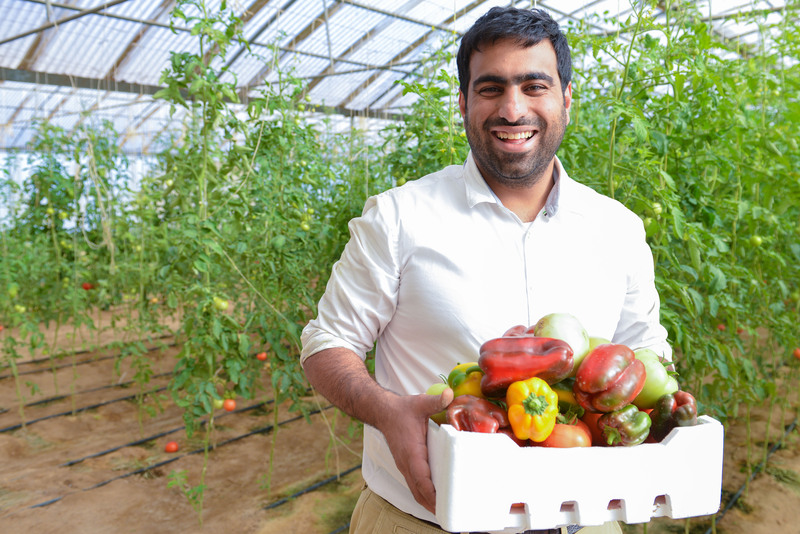 Ali BouKhamseen’s passion for international cuisine and fine local ingredients led him to start farming, on top of maintaining a job in the energy sector. He recalls his early introduction to international flavors and specialty crops as he accompanied his father, a hotel franchise manager, to work, “I was an eight year old, playing in the kitchen of a hotel, eating the food made there, and getting familiar with all different cuisines early on.” Later, his father purchased a farm, and Ali’s early experience is reflected in his current management of the Kenaneya Farm. Ali participates in Kuwait’s seasonal farmer’s markets, is a tour guide for the neighboring Sadeer Farm, and supplies potatoes to Kuwait’s organic Elevation Burger. AGSIW spoke to Ali about his shift to farming, the farmer-chef connection, Gulf Cooperation Council organic certification, and water scarcity in Kuwait. AGSIW: Where does Kenaneya Farm get its name from? Ali: Our family is originally from Al-Hasa, Saudi Arabia. My father named “Kenaneya” after the farm our great, great grandfather used to own. The current Kenaneya in Kuwait was established in 2006. It was named after an older farm in Saudi Arabia with the Kuwaiti farm as the seventh- and eighth-generation descendant. When people ask me about the meaning, I say I don’t know and my father doesn’t know as well. However, the closest interpretation of where the name comes from is Kayan, which means the location or habitat. A lot of people in the Arabian Peninsula relate to the term Kenaneya, but because it has not been used for generations, its meaning got lost. AGSIW: How did you incorporate working in the energy sector with farming? Ali: In the beginning, I felt my career was just stagnant in such a big company like Kuwait Energy. I found myself with a lot of energy and I think a lot of Kuwaitis from my generation can relate to me. Most of us are moonlighting and we do it for two reasons: to get extra cash or practice a hobby or passion. I am a big fan of international cuisine, but I noticed a lot of times when there is a dish that comes internationally and has to be done with local ingredients, it gets lost in translation. An example is zucchini; it is often dark green internationally, but in Arabia it is white. I’m a problem solver, so the first thing I did at Kenaneya is switch the zucchini seeds from white to dark green. Coincidentally, there was a farmer’s market happening and they were struggling to get farmers to present their products. I participated with the dark green zucchini produce and noticed that a lot of people were surprised to find that this product could be grown in Kuwait. So, I started marketing and very soon there were a lot of farmers growing other specialty crops and I think that’s really what fascinated me is the problem that I solved within an industry that I like, the food and beverage industry. My relation to the food industry is not new. My father was a hotel franchise manager. In the early ‘90s, the hotel industry was the one introducing continental gourmet foods to the region. When I was eight, I used to eat burgers that were made with natural ground beef. I got to understand how ingredients make good food. My father used to work in the evenings and he used to take me with him. I was an eight year old playing in the kitchen of a hotel, eating the food made there, and getting familiar with all different cuisines early on. And I think that’s really influenced my perspective on food. My father bought Kenaneya in 2006 but he wasn’t paying attention to it and suddenly I found myself engaged with it and started experimenting. With the ease and accessibility of social media, I was able to put my name out there as an experimenting farmer in an efficient way. Many others who post on agriculture on social media post their accomplishments, while I choose to focus on improving the products or farm operation because a lot of people don’t know that farming is only 10 percent agriculture and 90 percent business ownership. I make sure that we keep cash afloat so we can afford the commercial line as well as what I like to call the heritage specialty line. AGSIW: In what ways do you strike a balance between commercializing the farm and producing local specialty crops? Ali: I am a farmer who understands the value of a good potato. Most potatoes in Kuwait don’t meet the standards to be made into French fries for international franchises. A lot of the potatoes grown in Kuwait are for the domestic market, and in Kuwait we lack factories that produce industrial varieties of potatoes. I managed to catch up on industrial potatoes needed to be grown because the customer base in Kuwait values fresh French fries. Elevation Burger contacted me asking if I “can make proper potatoes.” Ever since I have been producing local quality potatoes for an organic market. AGSIW: Given the increasing demand on local organic produce, how challenging is it to have your vegetables certified organic? Ali: I’m not certified organic. The organic movement in the GCC has been very strong in the past five years. The GCC has a draft for an organic product law, which is based on a draft of a European Union regulation regarding organic farming. It is to provide an organic certification on local standards, which means that they don’t export to Europe, but will be certified organic in the local market. The first GCC country to focus on organic products was the United Arab Emirates, followed by Saudi Arabia. In Kuwait, I am part of a group of individuals trying to place an emphasis on local organic products. I’m working with partners in different industries, the restaurant industry, beauty, and makeup, and others to make sure that we can set a standard locally here in Kuwait for organic products, whether edible or not. A lot of people also don’t understand what organic means. There is an extreme right and an extreme left view on organic as well. The reality is that organic is just an agreement in a certain jurisdiction on a better practice and more sustainable product. This is something you need to establish locally. In Kuwait, I think we would need three to four years until we could sell organic local products. It is important to note that there are some farms that are certified organic from a European institution; they mainly do it for export, however. AGSIW: There is great interest among millennials in local, organic dining and food festivals, to name a few: Taste of Kuwait, Shakshooka market, Farm-to-table initiative, and Community Table. What is driving this interest and connection between chefs and farmers? Ali: Part of it is education among this young generation. For instance, I can speak of one chef I worked very closely with who graduated from a college of culinary arts in Florida. Whenever I ask him “Why do you want to work with farmers?” he says that the first thing they taught him in school was how to buy from farms. So, he has been doing it since he was 19 years old. Another close chef friend of mine does it because she is also a farmer. Both of these chefs don’t have restaurants, but they work with local food festivals and the community. When chefs work with farms and they start using local ingredients, they break away from any kind of procurement or commerciality. This creates a much friendlier atmosphere. They’re not competing with anyone. You just want to make sure that you’re not compromising ingredients and deliver the fullest flavors and get really creative by cooking off the recipe books. Restaurants often say that it is very difficult to work with farmers because farmers cannot guarantee consistency. In these food festivals, food is a lot better and fresher, which makes people much happier. Local produce feels more special than wholesale in a way that is connected to the source. There’s something joyful when you’re connected to the source. AGSIW: What are some of the challenges that you face as a Kuwaiti farmer? Ali: In my area in Abdali, we are competing with the oil rigs for the water sources because they are more valuable to the government than farms. Water that was developed for us is now going to drilling operations. There are other issues with the water sources in Abdali, which keeps our operation very expensive. People in other countries have rainfall to take care of their crops; we, in Kuwait, have to buy water tankers. A second challenge is people; Kuwait is a noncommercial terrain for agriculture. Getting familiar with crop diseases and introducing microorganisms that are good for agriculture is a very difficult thing. Prices and the lack of organization of crop development are other issues. To connect with Ali visit the Kenaneya Farms Instagram page and website. This post is part of a series on food culture in the Gulf. This series features progressive innovations in food culture, sustainable agriculture, and health in the Gulf states and considers their potential economic and social impacts.